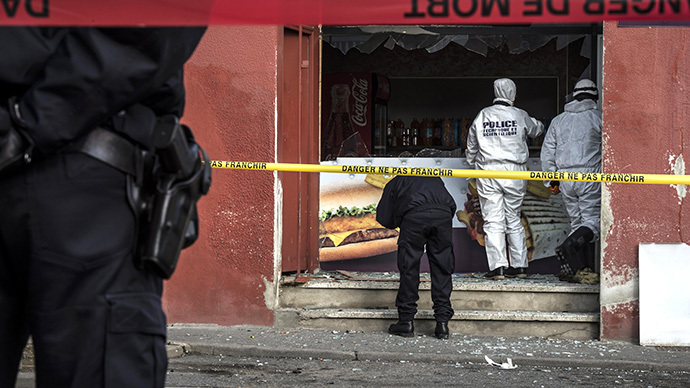 An explosion has been reported in a kebab shop near a mosque in Villefranche-sur-Saone, eastern France. There are no reports of any injuries and the cause of the blast remains unknown. The blast reportedly occurred around 6 am local time at the eating establishment L' Imeprial, according to the local newspaper Le Progress. The window of a nearby fast food restaurant was shattered by the explosion. Police have cordoned off the area, and firefighters were dispatched to the scene. "I am afraid that is linked to the dramatic event that occurred on Wednesday," the mayor of Villefranche Perrut Bernard, who was at the scene of the blast, told the French daily. On Wednesday, 10 journalists and two policemen were killed after gunmen opened fire on the Paris office of the French satirical weekly Charlie Hebdo. Police have launched a manhunt for three suspects, identified as Said Kouachi, 34, Cherif Kouachi, 32, and Hamyd Mourad, 18. The youngest suspect, Mourad, reportedly handed himself in at a police station in Charleville Mezieres after seeing his name on the list of shooting suspects on social media. Thousands of people across the world have reacted to the shooting, which is believed to have been carried out in retaliation to the controversial cartoons by Charlie Hebdo, targeting religion and particularly the Muslim Prophet Muhammad. French police have noticed a string of attacks targeting mosques since the deadly shooting. On Thursday, four training grenades were lobbed into the courtyard of a mosque in Le Mans, west of Paris. One of the grenades exploded, and the other three were recovered by police. A bullet also struck the mosque. No injuries were reported in the attack. Police have yet to identify perpetrators or establish a motive in the attack. An assailant also opened fire near a Muslim prayer room in the Port-la-Nouvelle district near Narbonne in southern France on Wednesday night. The door to the room was damaged and a window was broken, but no injuries were reported in the attack. The local prosecutor told AFP the room was empty at the time of the attack. An investigation into the incident is currently underway.